Average Breaking Strength in Lbs. *Call for AAR (Association of American Railroad) approved items. Standard finish is black painted and waxed. Other finishes available upon request. For general packaging, bundling and palletizing. Black, painted or waxed and galvanized Steelbinder® strapping is made from tempered, shock resistant steel for a wide range of packaging applications ranging from general palletizing to unitizing small irregular shapes. A nail can be driven through Jobsite Steelbinder®. A convenient, money saving strapping method. Use the Model ST101 tensioner. Convenient self dispensing cartons of Steelbinder® black strapping which fit in the ST458 case. 200 feet/roll. Use the Model ST101 tensioner. 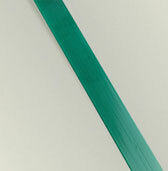 Polypropylene is the most economical type of plastic strap and is adequate in many applications. Polypropylene does not require the use of scored seals and can also be heat sealed or used with our Sealless Friction Weld Tools. Embossing—Strengthens the strap dimensionally and allows for the use of non-scored seals. *Available in multiple colors—call your Gerrard representative. Also Available: Woven and Non-woven Polyester Cord, Low Elongation Polypropylene, Jumbo Coils and Nylon Strapping. 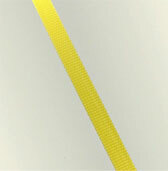 Polyester strapping is the strongest plastic strapping material. The highest initial tension can be applied and retained over a period of time compared to other plastic strapping materials. Polyester is available in both machine grade and hand grade and is easy to recycle. Polyester is smooth and requires the use of scored seals. Polyester can also be used with our friction weld tools or be heat sealed.